Box Dimensions (LxWxH) 21.102 x 9.528 x 1.89"
Cordura Carrying Case is rated 4.7 out of 5 by 6. Rated 3 out of 5 by Richard from Excellent feature saved the day. Product did not fit my scope as well as hoped and cosidered returning it. However, it did provide ample padding aound the scope for protection . An excellent feature that I felt justified keeping the product. To that extent I am satisfied with the product. 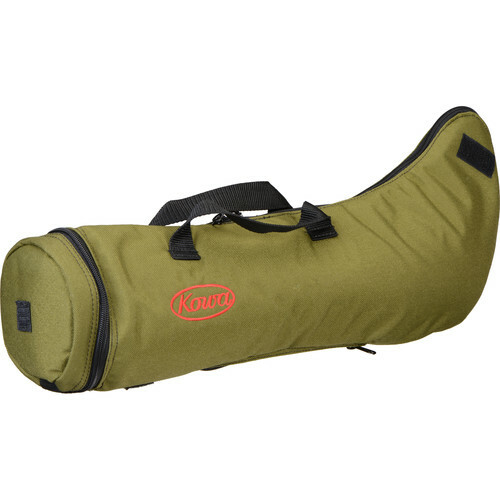 Rated 5 out of 5 by Anonymous from Great case for Kowa 821M spotting scope This carrying case is a must for the Kowa 821M spotting scope. It protects the scope during transport and while using it outdoors. Rated 5 out of 5 by Jim the hunter from Lots of bag for your buck This bag is worth the money, protects the scope impeccably, and keeps my investment in original condition. Rated 5 out of 5 by Bill from Yes I would recommend this product Fits my scope perfectly!